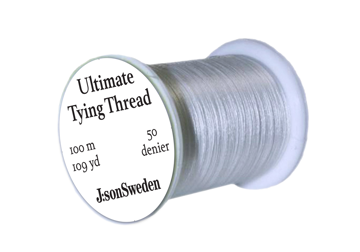 J: s son's thread is only 50 Den thick and so strong we argue that no other thread with these benefits is stronger. It's easy to slice - useful when you want to dub, for example, CDC - and it does not bump into the body thanks to its flat design. It also does not cut through foam or other materials that may cause a weakening of common binder. J: Son Ultimate Tying Thread is transparent and easily colored with any of our pencils after the fly has been bound. Of course, it is on a bobbin that fits the most common types of binder holders and we recommend using one with ceramic inserts. Affordable and strong binder that does not build volume. Packaging: 1st coil with 100m binder per pack or bulk pack of 12p coils with 100m binder per coil.